Staghorn ferns are dramatic plants both in the exotic places from which they hail and in the home environment. 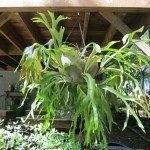 Although they can be a little tricky to get just so, once a staghorn is established, you can expect few problems with them. 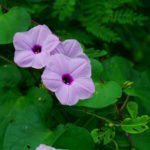 Once in a while, however, your staghorn may get sick and that’s why we put this article together. Read on to learn more about diseases of staghorn ferns. Staghorn ferns can be interesting and exotic additions to your home or landscape. Their large, antler-like leaves are showy and dramatic, making them a favorite of fern enthusiasts. 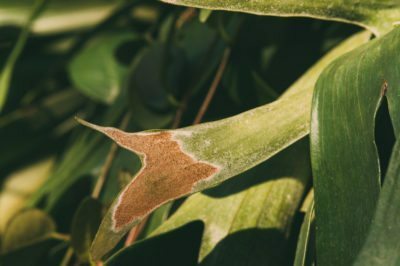 Like any plant, diseases of staghorn fern can develop, but they’re extremely few and far between. 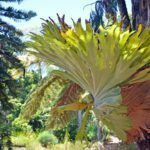 In fact, sick staghorn ferns are much more likely to be troubled by incorrect growing conditions than they are actual disease, so if your plant is looking unwell, take heart. It’s probably something completely fixable. Rhizoctonia. When black spots appear on the basal fronds and begin to spread toward the growing point, it’s time to act fast. This is the calling card of Rhizoctonia, a fungal pest of staghorn fern. If left untreated, the black spores will continue their march and kill the entire plant. First, withhold water entirely and reduce the humidity around your plant. If that doesn’t make enough of a dent, try a general use fungicide. In the future, monitor the humidity and the plant’s watering, since excessive moisture is necessary for Rhizoctonia to survive. Mealybugs and scale. Mealybugs and scale can appear to be diseases even though they’re actually pest infestations. These sap-sucking insects are master mimics, making themselves appear as white, fluffy tufts or waxy shields attached directly to the plant. Mealybugs are a little bit easier to recognize as insects, but they produce copious amounts of white fuzzy wax that can hide their numbers. Avoid using oils on staghorn ferns, but insecticidal soap can be used to destroy colonies. It may require more than one application, so monitor your plant closely during treatment.